Why we love it: All day freshness for those who are sensitive to Baking Soda. 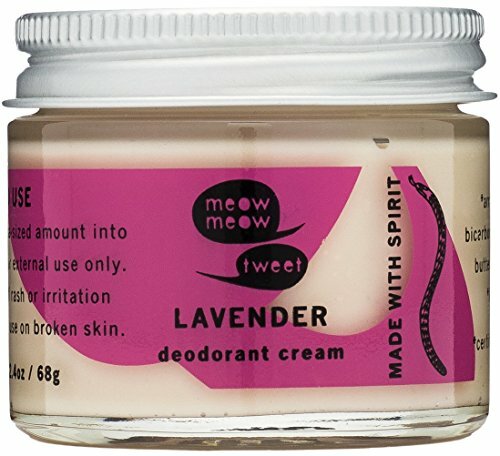 Safe and effective, this deodorant cream from Meow Meow Tweet uses simple, non-toxic ingredients to keep you feeling and smelling fresh all day without Baking Soda or Clay. Coconut Oil prevents odor causing bacteria while Arrowroot Powder absorbs moisture and wetness. A bright, citrusy scent comes from Grapefruit essential oils and gives a sweet, delicate aroma. Gently massage a small amount of product into each underarm for all day benefits. All Meow Meow Tweet products are made with organic, unrefined plant oils and butters, steam-distilled and cold-pressed essential oils and organic and wild-crafted botanicals. They pride themselves on being a vegan brand, and use no animal-derived ingredients. Meow Meow Tweet is Leaping Bunny cruelty-free certified.